Stonebrook Equestrian center is a full service boarding and training facility catering to the needs of horses and their riders. Located at the base of Spencer Mountain, our rolling hills and pristine environment are unequaled. We pride ourselves in offering the best amenities, care, and quality training. We offer customized feed programs, group and individual turnout, and training programs designed around the needs of each horse and rider. We also offer a select group of dressage horses and prospects for sale. Please feel free to contact us for more information or to schedule a visit. 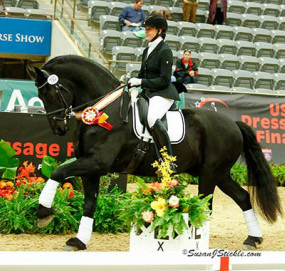 Congratulations to Claudia and Marco Van Laar" for and outstanding show season.